For more than a dozen years, I have been working to expose anti-Christian bias within America’s popular curriculum. But it wasn’t until I ran across a copy of Curriculum Standards for Social Studies,1published by the National Council for the Social Studies under a US Department of Education grant, that I realized the force of law was now driving the agenda. Can it be any clearer? Rather than teach America’s history and founding principles for the preservation of American liberty and Western Civilization, the new mission of social studies is to prepare our children to accept the transformation of America. In fact, the NCSS are missionaries of a new religion operating in the field of American education. Unlike Christians, these particular missionaries have government backing, free reign with captive children, and operate under the guise of “education” – and thus under the radar of most Christians. Before building a “new” structure, the “old” must be torn down. Christianity, the foundation of Western Civilization, must be bulldozed. I find three primary indoctrination methods publishers use to undermine Christianity. The first is the censorship of America’s true Christian heritage. The second method I call association propaganda – the linking of negative ideas or events with Christian principles, people, or groups. Finally contextual redefinition changes the meaning of written text in order tosupport a pre-planned conclusion that is different from the original author’s intention. There are other subtle methods, but most are variations of these three. All of these methods of indoctrination have one purpose – to convince our children to reject Biblical Christianity and to accept a secular worldview: more…. 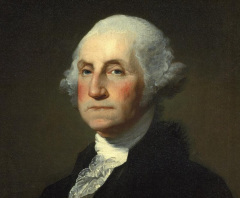 Imagine having your teenager emerge from a U.S. history course with only a vague recognition of the name “George Washington.” Suppose that course mentioned the father of our country with reference to only one speech – no discussion of his military leadership and triumphs, his personal sacrifice to accept the call to become the first President, or his wise and steady leadership during the tumultuous first years of our nation. More…. 1. According to McGraw Hill, 9-12 AP, “American Democracy Now”) America is a Democracy not a Constitutional Republic. Truth: Mrs. Eliza Powell asked Ben Franklin in 1787, as he left the Constitutional Convention, “What have you given us?” He replied,”A Republic if you can keep it.” From federal to local governments, every decision made by lawmakers must comply with our Constitution. Not so with a democracy. (A lynch mob is a democracy). In a democracy, whatever the majority decides the minority must endure. Our constitution is designed to protect the minority and the individual. There is not a full explanation of the Constitution in this textbook, but a lot of art work saying we are a Democracy. 5. According to “American Government and Politics Today” Houghton, Miffli, Harcourt, 9-12, “…African Americans…feel a sense of injustice…and this feeling is often not apparent to, or appreciated by, the majority of white America.” What?! Truth: That first sentence reveals the author’s bias. Fact: An illegal vote cancels your vote. That equals the disenfranchisement of the legal voter. A photo ID is required to board a plane, cash checks, rent anything, obtain a library card, join the YMCA, etc. Moral virtues must be learned, therefore they must be taught. With no 10 Commandments, and the teaching of secular humanism, there are no absolutes, therefore, any behavior is permissible. 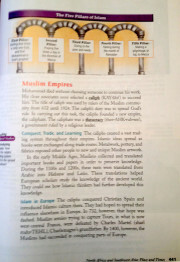 You can see the rest of the examples at the Textbook Tattler at the website TextbookAdvocates.com. Guess who wrote these biased Pearson textbooks? “Pearson hired Shabbir Mansuri, and Susan Douglass (a convert to Islam) to review and consult on the material being written for textbooks. One problem is that both of these individuals are associated with the Council for Islamic Education, a front for the Muslim Brotherhood in America.” Story here.